Once I see a chiropractor, do I have to go for the rest of my life? If you’re wondering whether chiropractic adjustments are something you have to keep coming back for after the first time, don’t worry; only you can choose when, if ever, you choose to have a chiropractic adjustment after your first experience with chiropractic care. Whether you’re coming in for injury recovery chiropractic care or want to know if chiropractic adjustments could help provide one-time pain relief, at the Caron Chiropractic Clinic, we’ll help you create a chiropractic care plan that’s right for you. We see patients who come in once and patients who schedule regular chiropractic adjustments to keep their spines aligned and bodies feeling healthy. We provide St. Paul and East Minneapolis, MN chiropractic care to patients with a variety of chiropractic needs, and our professional chiropractors will help you decide whether you want to continue chiropractic treatment in the future. One-time chiropractic care is always an option for our patients, especially those who only require one adjustment to fully heal from an injury or find lasting pain relief. If you’re someone who isn’t looking for a life-long chiropractic clinic or routine adjustments, our office is still the right place for you. However, it’s important to keep in mind that not all injuries or pain can be completely healed in one appointment. For more severe injuries or for chronic pain, more routine chiropractic care is recommended to help your body move freely on a daily basis. Injury recovery chiropractic adjustments can require several appointments, or you may be so lucky as to fully recover from your injury after one adjustment. Our chiropractors have years of experience healing injuries with chiropractic care, so we’ll be able to help you create the best injury recovery plan for your body, whether that be a one-time chiropractic adjustment or more routinely scheduled chiropractic care over the course of a few weeks or months. Although routine chiropractic adjustments are by no means necessary for everyone, nor must you continue chiropractic care after your first appointment, we often recommend regular chiropractic adjustments to improve overall health and wellness. With spinal adjustments, we are able to keep your spine into the correct alignment, ensuring that you reap all of the benefits of spinal adjustments, including faster injury recovery in the future, improved circulation, better range of motion, and several other benefits. 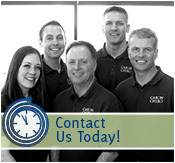 To learn more about routine or one-time chiropractic care, visit the Caron Chiropractic Clinic, or contact us at (651) 255-9999 or info@caronchiropractic.com. Providing St. Paul and East Minneapolis, Minnesota chiropractic care, we are conveniently located whether you’re in need of one-time care or plan to visit us for regularly scheduled appointments. So come in, relax, and enjoy the feeling of living pain-free. This entry was posted	on Wednesday, February 1st, 2017 at 6:25 pm	and is filed under Chiropractic, Chiropractic Treatments, Chiropractor, Chronic Pain, Personal Injury. You can follow any responses to this entry through the RSS 2.0 feed. You can leave a response, or trackback from your own site.